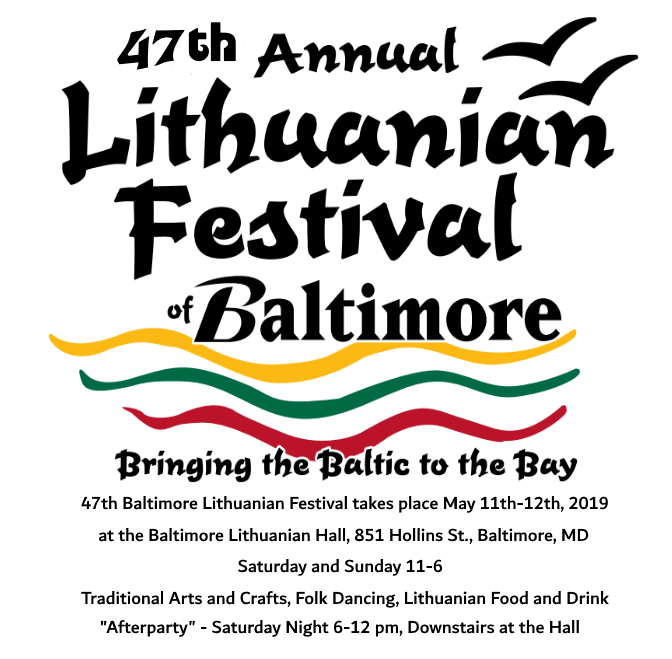 The Lithuanian Festival Committee of Maryland is pleased to announce the 47th Annual Baltimore Lithuanian Festival. ​We are back to the month of May! This year’s festival will be held Saturday and Sunday, May 11 and 12, 2019 from 11 am to 6 pm. The historic Lithuanian Hall will be home to a variety of vendors who will feature traditional Lithuanian food and drink, folk arts and crafts, jewelry, and more. Traditional music and dance performances will be featured throughout the festival and our very own museum and library will be open for exploration. The festivities will continue Saturday night from 6 pm to midnight where we will continue the party in the lower level of the Hall with full bar access, food, and music.